The national team has been handed one more change to progress in Russia. But it seems not even Messi, the nation’s messiah, will be able to drag them out of this one. Argentina are on the brink. Like a punchdrunk prizefighter groggy from 11 rounds of intense punishment, the Albiceleste look odds-on to fall as their mission to take the World Cup back from Russia threatens to degenerate into catastrophe. But Jorge Sampaoli’s bruised troops still have one more chance to redeem themselves, a final bout against Nigeria that will be winner-takes-all in the close of Group D.
It was a situation that few believed was possible at the start of this World Cup adventure. While expectations were logically the lowest for perhaps any finals in the modern age, the presence of stars like Lionel Messi and Sergio Agüero and Argentina’s enviable pedigree at the competition was still supposed to be enough to guide the team through a tricky first round and into the knock-out stages, where the likes of France and Spain would loom and prove worthy vanquishers, proving too much for this disorganised side. Now even that dignified exit appears a pipe-dream as the reality of the situation loomed large in Nizhy Novgorod. The manner of defeat, sparked by a catastrophic error from veteran goalkeeper Willy Caballero that most likely ends his international career in the most painful of manners, is what will most damage fragile Albiceleste egos. Inflated by three successive final appearances that have masked deepseated limitations in the team, this side has finally run out of road. 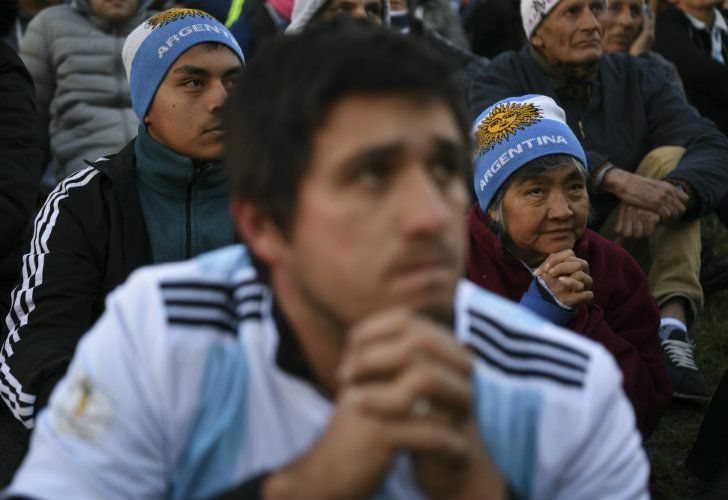 Not even Messi, Argentina’s messiah for an entire decade and architect-in-chief of that run of almost-success, can turn the tide this time round. Even during the singing of the national anthems he cut an uncomfortable figure on Thursday, head buried in his hands, apparently submerged in the intense pressure of leading a mediocre squad that barely did enough to qualify. In the game itself Messi was shackled brilliantly by a ferocious Croatia defence, touching the ball just 20 times in the first half – less than Caballero in goal – while Agüero, the only Argentina player to hit the net so far, managed a paltry seven. Those numbers tell the story of two stars suffocated up front, starved of possession by a midfield that has as its standard-bearer Javier Mascherano, past his peak and incapable of injecting pace and urgency into this stodgy side. The final image left by Thursday’s humiliation was a harrowing one: Mascherano pleading for a non-existent offside, Messi watching on from the edge of his own area as Croatia waltzed to a third goal via Ivan Rakitic that could yet prove decisive when the dust finally settles on this first round. Just to rub further salt into the wound, two of the Balkan side’s strikes came from two world-class midfielders – Rakitic and the incomparable Luka Modric – that Argentina could only dream of picking in that crucial area. Fortunately – and for reasons completely beyond the control of anyone in the Argentina camp – one final lifeline remains. Ahmed Musa’s fine double that downed Iceland yesterday means that a win over Nigeria might just be enough to squeeze Sampaoli’s men into the knock-out rounds, although the islanders could yet complete their own fairytale with a win over Croatia, after which would force goal difference to come into play. But it would take a brave man indeed to bet on the Albiceleste progressing at this point. Sampaoli’s tactical gambles have as of yet backfired hideously, while the general impression given from the Argentina squad is of a team that is at odds with its coach and simply hoping the nightmare is soon over. If Argentina are to produce the miracle and proceed into the final stages they must first learn to play as a unit, and at the very least give the ball to their other-worldy No. 10 who has looked sadly mortal so far in Russia. Hope and Messi is all they have left, and this time it might not be enough.